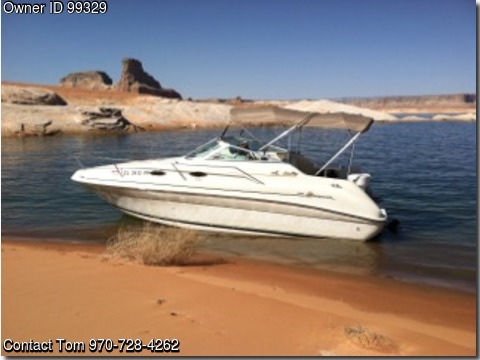 Please call boat owner Tom at 970-728-4262. Boat is located Hall’s Crossing, Utah. Excellent Condition, 350 hours total use on boat, approximately 15 hours With new motor. Full cover, twin Bimini tops, Sleeps 4 -V berth, mid berth, Galley. Sink, refrigerator, head with shower, Hot & Cold water, bilge pump, anchor, Coast Guard pack, GPS, depth finder, dockside power, compass, full gauges, hydraulic steering, mooring cover, rod holders, SS props, storage, swim platform, trim tabs, VHF, CO2 detector, transom shower. Carpeted with snap out protector liners, stereo & CD with Bose speakers. 2 New batteries. Matching dual axle trailer with surge brakes, professionally maintained.